International Women’s Day has roots in the struggles for fair pay and humane working hours for women who worked in factories and the movements for women’s suffrage in the U.S. and Europe. Marches, momentum and labor organizing worldwide between the 1850s and 1908 led to the first International Women’s Conference in Copenhagen, Denmark in 1910. The widespread celebration of International Women’s Day emerged from this conference, and the date of March 8th was set in 1914 as women around the world rallied for peace on the eve of the First World War. 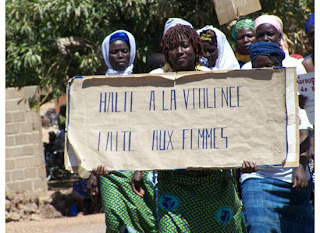 Today, International Women’s Day is recognized as an official state holiday in 30 countries, including Burkina Faso. From 2006 to 2008, I lived and worked as a Peace Corps volunteer in the village of Diapangou in the Eastern Region of Burkina Faso. I had the privilege of working with many talented and charismatic community leaders. In 2007, my community was among those selected to receive government funding for its Women’s Day celebrations, and I offered my help in organizing a short play about girls’ education. The celebrations that day included a bicycle race for women at dawn, parades, speeches, and our theater piece about a girl who has trouble succeeding in school because she has too many chores at home and whose parents would rather marry her off than keep spending money on her schooling. We presented our skit to over 300 villagers that had come from the 30 or so surrounding villages. My Peace Corps colleagues held similar events in their own communities, taught high school girls about the community and political leadership of West African women, and one dressed in a women’s wrap skirt and pumped water for women in his village all day. A teacher at my village high school made a point of cooking for his wife all day – no small feat when cooking involves tending an outdoor fire for hours, preparing ingredients from the market, and cleaning a freshly killed chicken. People ranging from dignitaries to village elders had outfits or shirts made from the special print of fabric that commemorates the 8th of March each year. Many people question the effectiveness of International Women’s Day Celebrations. Devoting one day a year to awareness of women’s work, health, and struggles for equality in cultures where gender-based violence and oppression is widespread (including the U.S.A) is clearly not enough to change structures of power and privilege. However, I found that after the theater production, people in my village understood better why I was there. Villagers continued to talk about the event for months afterwards, always thanking me for my involvement in helping to start converstaions about girls’ education. These conversations were an important part of how the community came to trust me and my counterparts. 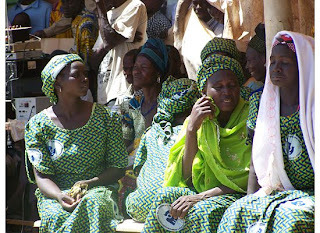 The celebration opened doors for discussions about women’s roles in our community, education, health and nutrition, and as a result, I was able to educate girls and women about reproductive health and family planning and help form a grassroots organization to support widows and orphans in my village. International Women’s Day won’t change the world, but it offers many of us a place from which to start.